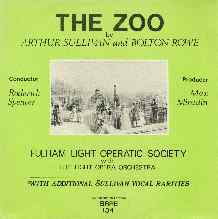 The Fulham Light Operatic Society, a semi-professional group based in London, gave the first modern performance of The Zoo on December 2, 1971. This recording, which was based on that production, never achieved particularly wide circulation. It was the D'Oyly Carte recording six years later that fueled the opera's renaissance. The biggest villain in this recording is the engineer: evidently, the microphones were placed in the front row of the stalls, so applause and laughter are the two loudest sound effects, followed by the orchestra, with the singers coming in dead last. David Sommerfield describes it as "pretty bad, especially the orchestra." Nevertheless, the live audience clearly enjoyed this performance, with B. C. Stephenson's jokes drawing laughs in all the right places. I suspect that we would have enjoyed it too, if our listening experience were not being filtered through incompetently-placed microphones. The singers are capable amateurs, and the orchestra, though rough in spots, are adequate. Roderick Spencer takes brisker tempi than on the D'Oyly Carte recording. On the whole, I think he captures the spirit of the work better than Royston Nash, though the chorus do not always keep up with him. Perhaps the recording's greatest contribution is that it shows how strong an impression the opera can make, even in a production that is, at best, average. The Malcolm Sargent who plays Thomas Brown is evidently not the Malcolm Sargent, as the latter died in 1968, four years before this recording came out. (Never mind the unlikelihood of the famous conductor singing in an amateur operatic society.) Also, the singer sounds like a quite young man. Since The Zoo is a relatively short opera, the LP issue on Rare Recorded Editions was supplemented with the following "Sullivan Rarites:"
"Morn, happy morn!" (Trio), words by W. G. Wells, sung by Miranda Corner, Ann Meza and Carl Murray, with flute obligato by Auriol Lark. "When thou art near," words by W. J. Stewart, sung by Keith Arnold. "When love and beauty" (Madrigal), sung by Miranda Corner, Ann Meza, Margaret Blakeway, Keith Arnold and Carl Murray. "Over the roof," sung by Miranda Corner. "If doughty deeds," words by Robert Graham, sung by Miranda Corner. "The Sisters," words by Tennyson, sung by Miranda Corner and Ann Meza. "Love laid his sleepless head," words by Algernon Charles Swinburne, inserted into Sullivan's incidental music for The Merry Wives of Windsor. Sung by Carl Murray. "To one in Paradise," words by Edgar Allen Poe, sung by Keith Arnold. "Let me dream again," words by B. C. Stephenson, sung by Margaret Blakeway. "Sweethearts," words by W. S. Gilbert, sung by Miranda Corner and Carl Murray. Unlike The Zoo, these were recorded in a studio with piano accompaniment. The singers sound like professionals (Keith Arnold's voice being the spitting image for Thomas Round's). If the opera is a mixed bag, these selections are a sheer delight, providing ample evidence of Sullivan's great skill as a song-setter.